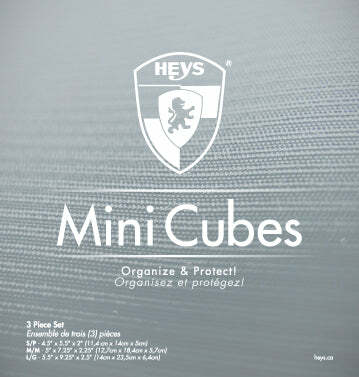 The Heys Mini Cubes are another example of how we are always striving to provide you with simple and efficient ways to keep your items protected and organized. These fully padded, lightweight and colourful bags will put an end to the frustrating ordeal of having your power cords, electronics and accessories being strewn all over inside your main bag. 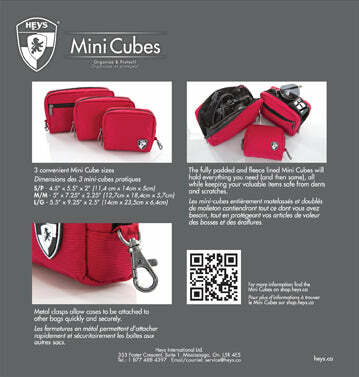 With the 3 different sizes, you'll be sure to always have a Mini Cube to suit your needs. Every Mini Cube features a fully padded interior, which adds a layer of protection to your valuables while being stored on the go. Mesh pockets on the inside ensure that you can find whatever you may have put in your Mini Cube quickly and easily. This, coupled with a zippered opening that allows you full access to the inside of the bag, allow these to be the perfect organizational solution for not only travel but everyday usage as well. Smaller objects can be stored in the pocket built into the back of each Mini Cube and the lobster claw hooks allow the bags to be quickly and easily attached to other bags to ensure that your valuables stay right where you put them. The Mini Cubes will keep you organized no matter where you are!